Notepad++ version 6.4.1 was released recently and contains some exciting new additions.Top of the list is the new function list which has been awaited for a while now and is a popular feature in many other code editors (including UltraEdit). New function list support allowing Notepad++ to show subroutines, qualify and unqaulify statements, table loads, info loads, mapping loads and store statements all identified within the function list. Removed some functions from the auto-complete file as they are only valid in expressions not the script. Fixed some minor issues with keywords being highlighted when they were shown in the wrong positions. Added tool tips for some additional functions. The if() function cannot be differentiated from the IF...ENDIF statement and thus will be shown as a collapsible block with an incorrect end point. Tool tips are not available for all functions. Remaining functions to be added in a future release. As usual, head on over to the QlikView Notepad++ page to grab the download and instructions of how to update. If you find any issues, leave me a comment below and I'll try resolve them in a future release. Stephen Redmond (from the well known QlikTips.com) has been busy writing a sequel to QlikView 11 for Developers which I reviewed a couple of months ago. 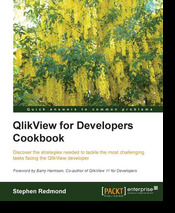 Unlike it's predecessor, QlikView for Developers Cookbook looks at a serious of "recipes" for solving well known QlikView problems. Coming from Stephen you can guarantee some advance QlikView content and great advise. I'm eagerly awaiting my copy for review. It might seem obvious but you need to have installed the QlikView wordfile before the functionality described below will work. If you haven't already, details of how to do so can be found on the QlikView for UltraEdit page. The function list can be shown in UltraEdit by either going to "View -> Views/Lists -> Function List" on the menu bar or by pressing F8. By default the function list is shown on the right hand side of the screen but can be dragged and docked to just about anywhere you want it to sit. In the first 2 parts of this series, I looked at how dates are stored in QlikView and how to ensure you have them in the right format to be most effective. 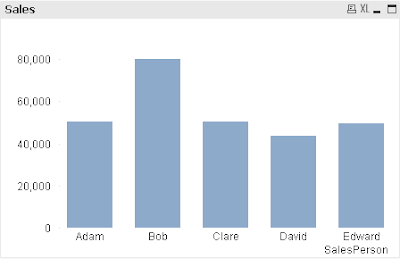 So now that we have that out the way, lets looks at how we can start to make dates more useful for using in charts and objects within the front end of QlikView. Despite looking in part 2 at how we worked to combine parts of a date stored separately in order to create a "true date" from them, we often want to do the reverse also and split the date into its composite parts. For example, we might want to be able to select individual years without having to select every date in those years, or we might wish to be able to display a bar chart showing our sales by month. Dmitry, who developed QViewer, posted a great little trick for seeing the contents of a resident table whilst debugging your script in QlikView. You can view his original post here but I thought I'd give you a quick step-by-step of how to make it work. The first thing you need to do is to download and install QViewer if you haven't already. If you don't know what QViewer is, check out my earlier review post. You an download it from the EasyQlik.com website and best of all there is a free version. The only limitation is that it will load only the first 10,000 rows from the QVD file. This is normally more than enough for most applications and especially when debugging. If you use QViewer a lot then the full version removes this limitation for $45 (USD) (and will also help to encourage Dmitry to continue his great work no doubt). You will be calling QViewer from within your QlikView script and so you need to change the privileges of your QlikView script to allow it to execute external programs. By default this is prohibited. In the QlikView Script Editor, select the Settings tab at the bottom left and ensure the "Can Execute External Programs" check box is ticked. I'm currently awaiting a hard copy of QlikView 11 for Developers but until it arrives I've been skimming through the e-book. A full review will follow when I've digested it properly but so far I'm quite impressed. For those new to QlikVew it offers a step-by-step guide to building your first QlikView application and includes many of the most common obstacles and their solutions. And for those who've been working with QV for a while I guarantee you'll still pick up some useful tips and tricks along the way such as best practice and dashboard design.